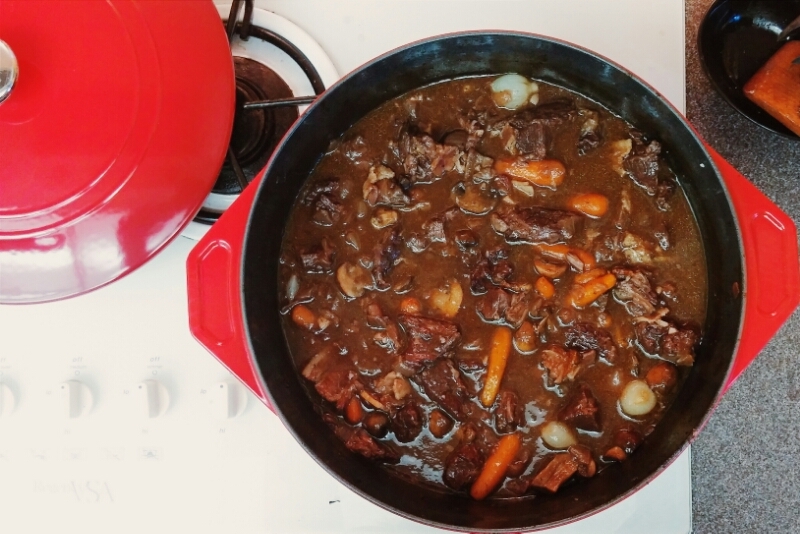 The actual name of this recipe in the food and wine recipe is Beef Stew with Red Wine. It was a result of googling beef bourguinon soo if anyone knows what distinguishes beef bourguinon please enlighten me! The boyfriend recently bought a dutch oven from Costco and wanted to try it out. After about 20 minutes of trying to figure out which recipe to christen the pot…we found Jacque Pepin’s contribution to Food & Wine! We used bacon instead of pancetta and we didn’t drain the water because we didn’t want to waste bacon flavor. We also doubled the recipe and put in 10x more veggies than the recipe calls for. We made fresh pappardelle to complement the dish! Dish photos to come!